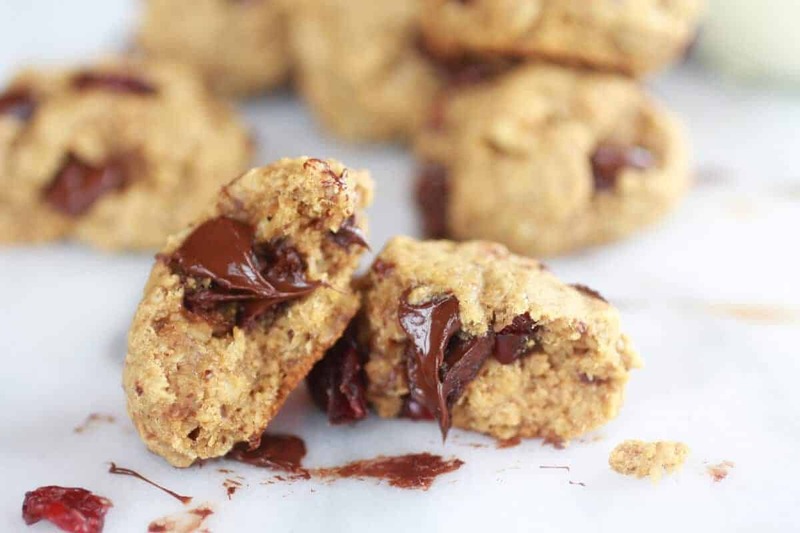 Yup, these cookies are healthy enough to eat for breakfast. No, I am not trying to mess with you. Promise. Asher and I made these over the weekend. Oh, and real quickly here, we have got to clarify something. I am pretty sure there are a lot of you out there who think Asher is my daughter. Nope. I mean come on guys I am nineteen. Although, my mom did have her first kid at eighteen. Asher is however my favorite little girl. She is also completely addicted to chocolate. I think she’s even proud of it. Did I mention that this girl is insanely smart. Sometimes the things that come out of her mouth amaze me. I think she picks up on a lot of stuff around the house, which also make me wonder what on earth she say’s at school. That thought is a little scary (read house full of teenage boys). So we made cookies and we made um healthy. Really I can honestly say you can feel good about eating these cookies. When Asher and I make cookies though, or really anything, I am pretty sure that a fourth of the dough ends up in her mouth and another fourth ends up on one of her princess gowns (she’s got like 6, all from Target). Yeah, she wears ball gown around the house with no tights, no leggings and no sweater when it is blowing snow and 20 degrees outside (which has been the last five days). I get cold just looking at her. I was pretty fearful that these cookies would not turn out, but they did. I have made them three times in two day’s. These cookies are definitely not very sweet, but their flavor is awesome. They take maybe twenty-five minutes to make. Which I would say is a dangerous thing, but I mean they are seriously good for you! Definitely good enough to justify eating cookies for breakfast. 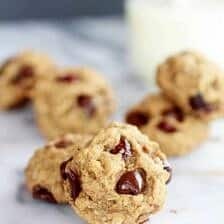 Tasty, healthy cookies. Really I can honestly say you can feel good about eating these. Preheat the oven to 350 degrees F. In a medium mixing bowl combine the flour, oats, ground flaxseeds, baking soda and salt. Whisk to combine and set aside. In a microwave safe bowl or glass measuring cup microwave the canola oil and peanut butter together for 30 seconds, stir to combine. Add the mashed bananas, egg, honey and vanilla. Whisk until combined. Add the wet ingredients to the dry and stir with a mixing spoon until the dough comes together. Fold in the dark chocolate, dried pomegranates and walnuts until evenly distributed. Drop about 2 tablespoons of rounded dough onto a parchment lined baking sheet, placing them about 2 inches apart. Bake for 10-12 minutes, or until set and lightly golden around the edges. These cookies will not flatten or spread. They pretty much just hold their form. Guy’s come on. It is cookies for breakfast. Make them now! 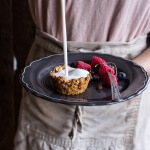 Oatmeal Chocolate Chip Cookie ‘n’ Milk Breakfast Cups. These sure look yummy. I am not much for chocolate chips, but my husband loves him some chocolate. I need to make these with some with and some just dried fruit. I would also use coconut oil. Coconut oil is great in these! Hope you and your husband like them! I am totally good with cookies for breakfast! That ooey gooey chocolate oozing out is killing me right now! Maybe if I close my eyes they will appear in front of me??? If only we have magic powers! I was wondering if you could leave out the flaxseed. yes, you can leave out the flaxseed, but add a tablespoon more of flour. Hope you enjoy these! I’m all for cookies you can eat any time of day. Is there anything better? Looks great! I love this. I have a similar recipe on my blog, but I like the fact that this one has flaxseed, bananas and honey. Definitely going to try this! Hope your son likes them! 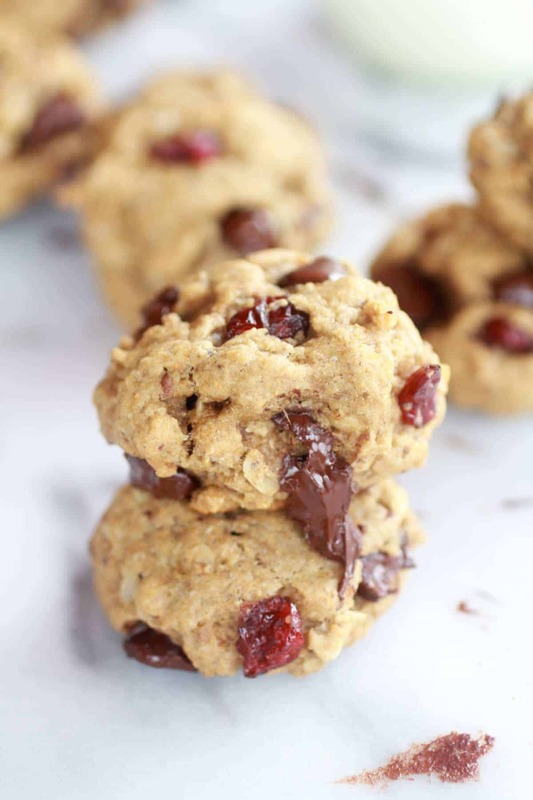 Breakfast cookies – YES PLEASE. I’m all over these! I know right? Whats better than cookies for breakfast! Yum! We’ll have to bake these for snack one day at school! I might have t make them at home as well! YES! Asher has been asking me to come to school maybe we could make these! Your welcome and thanks so much for pinning! I am loving these! 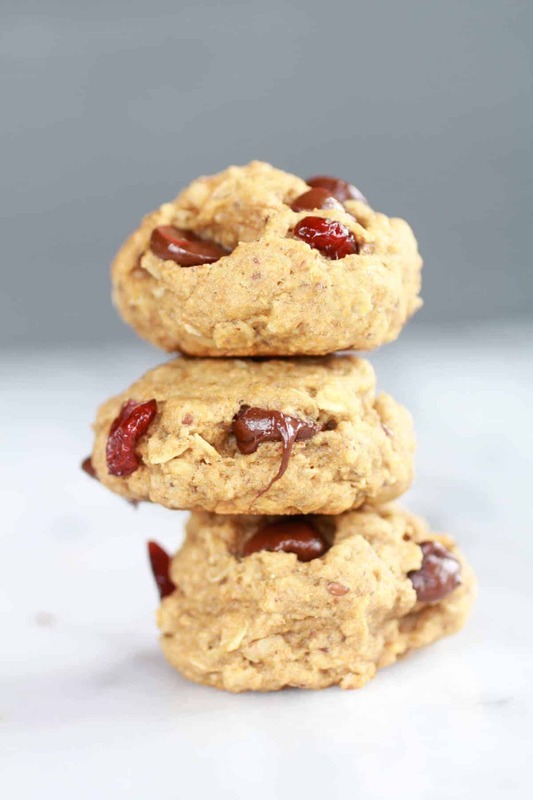 I’m always on the lookout for healthy cookies and I’ll take them any way I can get them and yours look fantastic! I like the addition of honey and pb! Thank you, cookies are the best! So happy to have you! Thanks for stopping by! 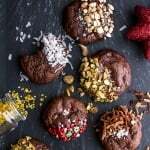 These look too tasty to be healthy 🙂 I love that more and more recipes are taking the healthy approach! It never hurts to be healthy! Wow, these look yummy. I think cookies for breakfast is only natural. I can’t wait to try these. I totally agree! Cookies for breakfast rock! I hope you guys enjoy these and thanks for the invite! These look SO GOOD! I think I have everything in my cupboard already – totally going to have to try these! Pinning! Oh and I’m a new follower, I love your blog! YEAH! Thanks so much for following! 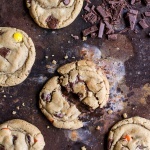 So I have clicked on like 10 of your recipes from one of the blog hops, and all of them look so good! Your photography is beautiful. I am excited to try all of them. I would love if you could share some of your 30 minutes or less recipes in our blog hop, http://shaffer-sisters.blogspot.com/2013/03/30-minutes-or-less-meals-link-up-party.html. This one, Gnocchi with Pistachio Pesto, Honey Granola Bars or any others that you would see fit. We are going to be watching you to see what you make next! Keep up the great work. Thank you so much! I am so glad you like my site! Cookies are not a problem! Well at least I think they are a good problem! We love cookies! Hope you like these and thanks for reading! Dried cranberries would be awesome!! Hope you like these! I know, it is crazy!! I so glad you mad the and liked them! Thanks for letting me know! Anytime I can have cookies for breakfast, it’s a good day! Cookies for breakfast is always a good thing! Thank you for the invite! Thank you, hope you give them a try! Wow lots of great things in these cookies. Thanks for sharing at Foodie Friends Friday Easter Brunch LInky Party! YUP! Lot of yummy healthy things! Oh, and chocolate of course! HA! Wish I could send you one through the computer! These would brighten up my breakfast! Great idea and oh how good they look! These sound super delicious and I like that you used oil instead of butter. Thanks for sharing on Thursdays Treasures. I knew it would happen after reading your lovely post and recipe. It grabbed me by the neck and threw me right down on the kitchen floor and screamed….MAKE ME..MAKE ME! And I will be…this is SO MY kind of breakfast. Thanks so much for sharing at Weekend Potluck..do come again soon. Hope you like these!! You comment is to funny! Cookies for breakfast? I like this little girl’s thinking! I’m missing the flax seed, but the next time I’m at the store I’m going to have to get some. Can’t wait to try them! she is a very smart little girl!! Oh yes Please! Cookies for breakfast?! That is my kind of way to start the day! Thanks for sharing at Show Me Your Plaid Monday’s! I could go for a few of those right now! Asher sounds like a smart cookie to me 🙂 Pinned and featuring tonight at Mom On Timeout! Trish, thank to so much for your constant support! These look great! Thank you for sharing on Thursday’s Treasures! I’ve featured them on Week 79. Please stop by and grab my “featured on” button. <3 and hugs! Thanks so much for featuring these!! You had me at “healthy cookie”! Anytime you can make a cookie better for you, I am a fan! Thanks for sharing at Time To Sparkle! 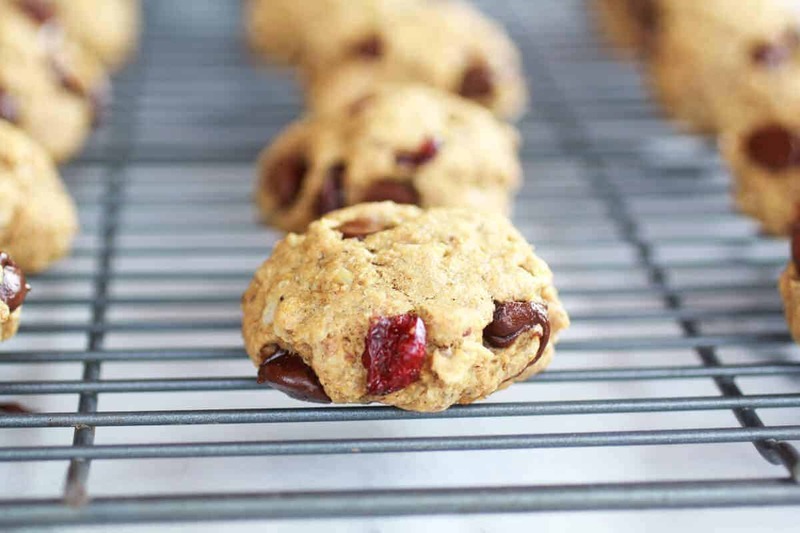 Healthy cookies are the best! Whyyy must you torture me so?! Ahhhhhh these are AMAZING! Will regular whole wheat flour work, or does it need to be pastry flour? I’m always looking for something healthy for my kids to scarf down before school. These definitely fit the bill. Thanks for sharing! 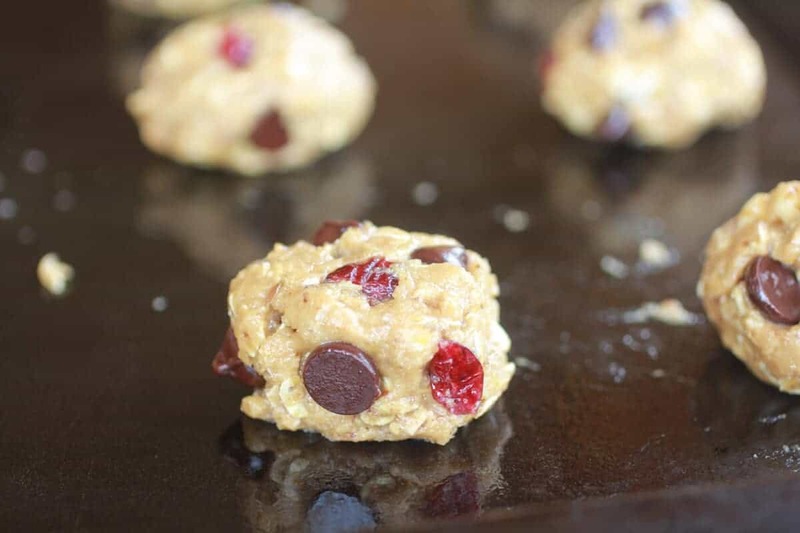 Your kids will love cookies for breakfast! Nothing is better! Cookies from Breakfast, yes please! Love that you used dried pomegranates, yum! I’m featuring these on my Facebook page tonight. Thanks from sharing at Thursday’s Treasures. Great recipe! My kids loved these, and we made variations on each batch that went in the oven. YEAH!! So happy you guys loved these! Thank you, Karin! I can’t wait to try this. My kids like small meals. One problem. My son is allergic to nuts and tree nuts. What can I substitute for peanut butter and almond butter? Thanks! Also pumpkin seed butter would work well too! Hope this helps and I hope you love these cookies! Hi! Store them in an airtight container and yes, you can freeze them after baking! I made these this morning for a mom’s club breakfast. They were a big hit. Thanks for the recipe. Great blog. I found you on Pinterest. THANK YOU! So happy you loved these! 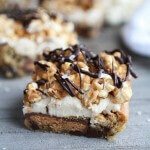 These look amazing but can I omit peanut butter for nut sensitive son? Love love your blog! I would not omit the peanut butter because it helps to shape the cookies. Can he eat sunflower seed butter? If he can, I would use that or you can also try using room temperature cream cheese. I have never tried that so I am not positive it would work. Let me know! hi, these look so delicious! however, I’m anti-banana (not allergic just have an extreme aversion). Was the banana flavor very noticeable? I often wonder if avocado could be a decent replacement for banana in recipes. Hi! The banana flavor is not huge, but swapping avocado is a great idea!! Let me know how it goes! I love this recipe but I was wondering if you could go without the oats. Thank you so so much. Hey Kyra, think the oat are kind of important because they make up a bulk of the cookie. So sorry I could not help! These turned out great! I was suprised how sweet they turned out. I did add about 10 or so drops of stevia to the batter, which I am sure helped. but I was impressed as far as super healthy cookies go these are so far my favorite!!! Here s a feast that s both merry and bright. We ve partnered with Tieghan Gerard, founder of Half Baked Harvest, to throw an ornament party complete with a tasty menu, including this main course and sides. Healthy cakes are made daily breakfast. 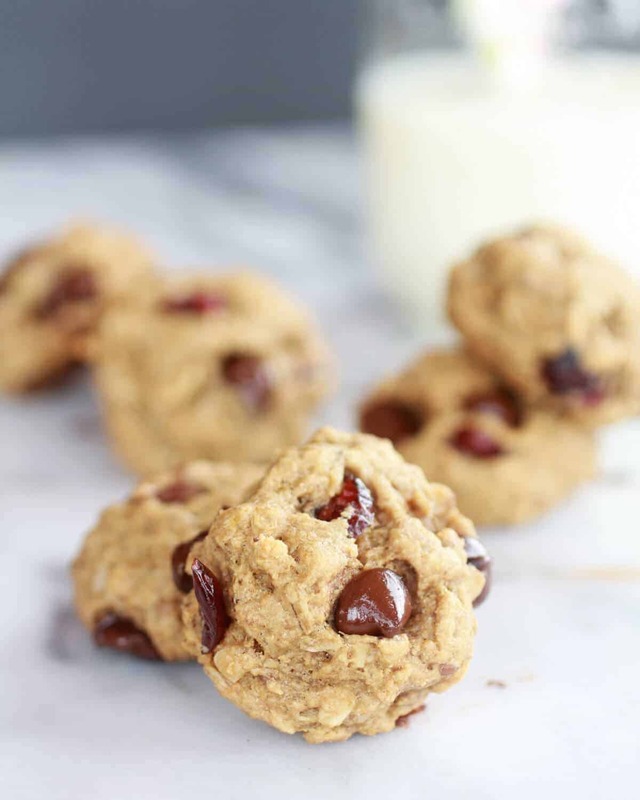 These super healthy “breakfast” cookies are soooo good! 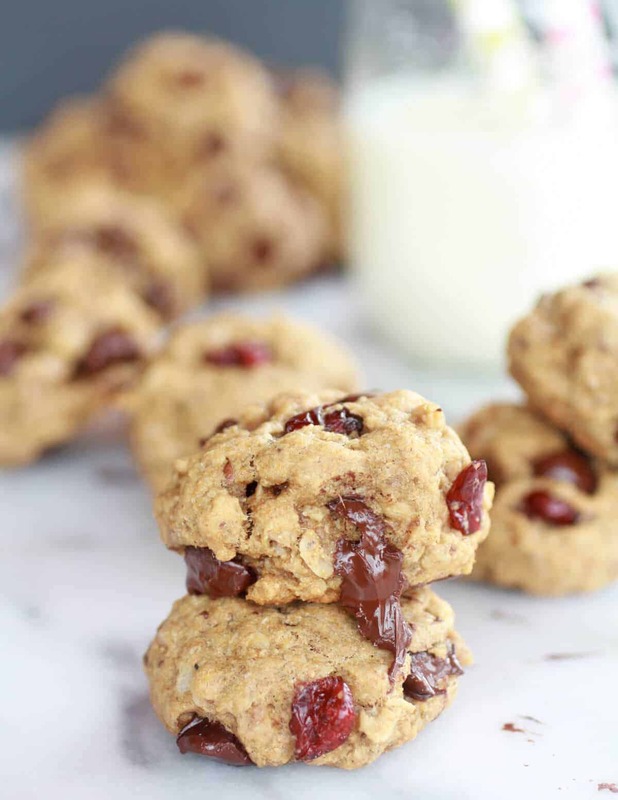 I’ve substituted different dried fruits, combined peanut and almond butter, dropped them onto a greased cookie sheet and have made them into balls. I can’t get enough of these cookies. I’ve shared them with friends and they love them, too. Thanks for this easy, delicious recipe!